Recently, a friend, Father Sean, recommended the Venerable Alfred Pampalon is the Patron of Alcoholics and Drug Addicts, on his Facebook page. I am not sure what prompted him to do, but it was a welcomed and helpful piece of information. As you know, there is a Catholic saint and blessed for every need; even those being proposed for sainthood have causes to mind. Today is the anniversary of death of Father Alfred Pampalon. For me, this is a great “find.” Why? Because for the last year my sister has been possessed by her addiction to alcohol. To date, she’s been brought to the hospital for various reasons: alcohol induced seizures, ulcers, depression and the like. Alcohol is truly an insidious disease. With this so personal experience I am humbled and moved by the fragility of those who carry such a cross as alcoholism and depression. In many ways my sister’s cross is an opening for grace to enter more deeply into my own sinful life. So, I am happy to know of Father Alfred and his patronage. Through his intercession I am hoping for a healing for my sister and my family, but also for others who carry this disease inside them. Alcohol and the related problems are a real cross to bear; Alfred’s was TB as was the residual set of health complications. But it is said that he had a burning desire to help his people know (meet) Jesus and to lighten the burden of those whose cross so very heavy to bear. 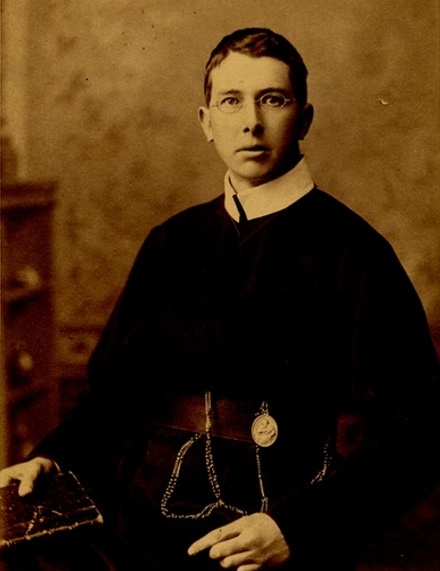 Father Alfred Pampalon (24 November 1867 – 30 September 1896), born in French Canada. Father Alfred was a Redemptorist priest who studied in Belgium. Father Alfred is known as a great apostle of the Saint Anne de Beaupré shrine. He died very young at the age of 28 of TB. his cause for canonization was opened and he was recognized has having heroic virtue. Thus he was declared Venerable Servant of God, May 14 1991, by Pope John Paul II. Dear Father Alfred, listen to my cry and come to my aid. Obtain for me the favors I desire. You are well known as the protector of people who are suffering in body, mind and spirit. You show special compassion for alcoholics and drug addicts. You have freed so many people from their dependencies. Free NN. (me) also, I beg you, dear Father Alfred, and free those people I recommend to you, especially members of my family. I come to you with confidence. I pray for myself and for all those who are dear to me. Come also to the assistance of the Church and of the whole world. Amen. Father Alfred realized clearly that “There is no virtue without prayer.” Here is a novena of prayers. Dom Antoine Marie, OSB, monk of the French Abbey of Saint-Joseph de Clairval, writes extensive biographies of the saints for his abbey’s newsletter. If you are interested, here is entry for Father Alfred.